Citrix has been a key part of IT infrastructures for the last 20 years. The functionality that Citrix provides its users is unparalleled, but enterprises are now conflicted with some of the challenges they see in Citrix implementations. So, when it comes to deploying Citrix-based solutions, many companies are hesitant. Two key factors are responsible for this. The first is the sheer complexity of the Citrix solution, and the second is integrating the many components of a viable Desktop as a Service, or DaaS, offering. In the last few months, we have looked at scores of solution providers who primarily serve the Citrix sector, and shortlisted the ones that are at the forefront of tackling the challenges faced by companies in the industry. A distinguished panel comprising of CEOs, CIOs, CMOs, VCs, analysts and CIO Review editorial board have selected the list of Top Citrix Solution Providers from over thousand entries. The companies featured here provide a look into how their solutions work in the real world, so that you can gain a comprehensive understanding of what technologies are available, which are right for you, and how they shape up against the competition. In our selection we have looked at vendor’s capability to fulfill the needs of Citrix landscape—both from a provider and consumer perspective—through variety of services that support core business processes. 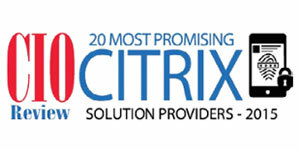 We present you to CIOReview’s 20 Most Promising Citrix Solutions Providers 2015. API Systems Inc An IT solutions company that improves productivity and profitability of businesses worldwide. Aternity Provides powerful Application Performance Management and End User monitoring tools to reduce business disruptions and increase user productivity. Atlantis Computing Delivers better performance than the fastest all-flash array, at half the cost of traditional SAN, on any class of enterprise storage. BlueCat Provides the foundation to build elastic networks that scale to match the ever-changing and unique demands on your infrastructure. Comtrade Comtrade Group is a leading technology company with over 25 years of experience in software engineering and product development. It employs over 1600 professionals located in 11 countries around the world. Gotham Technology Group, LLC Provides guidance and direction to IT professional in enterprise environments. The firm specializes in Virtualization, Storage, Supporting Services, Infrastructure, Security, Technical Staff Augmentation, Application Development, and Training. IGEL Technology A provider of thin and zero client software and hardware solutions for a secure workforce. IMSCAD Providing support for this technology directly to customers and Channel Partners globally. Lakeside Software Providing business intelligence tools to deliver improved end-user performance. NexGen Storage NexGen Storage offers value-driven hybrid flash arrays that let customers prioritize data and application performance based on business value. Nimble Storage Providing industry’s most efficient flash storage platform. Norskale Norskale is an innovative software solution that optimizes the way Citrix XenDesktops and XenApps Workspace resources are used to increase performance and reduce costs. Plan B Technologies, Inc A trusted Citrix Partner and provider of storage area networking, backup, recovery and archiving, security and network infrastructure and cloud virtualization solutions for infrastructure, application, and devices. PolicyPak Provides the functionality to lock down and remediate settings for desktops, laptops, VDI sessions, and personal “BYOD” device. Pure Storage Providing broad deployment of flash in the data center. Sams Tech Providing clients with business intelligence, strategic performance management, and sales/marketing automation. SSL A company that enables organizations to proactively identify clogs in their core infrastructure, stop unnecessary congestion and delays by providing cost effective and innovative solutions. Thomas Duryea Consulting A company that helps businesses enable mobility solutions, provide a seamless user experience across mobile, desktop and laptop devices and increase productivity and efficiency for users. Unicon Software Provides high quality software solutions for Desktop Virtualization environments. Unitrends Revolutionizing the technique of augmenting Citrix technology standards with robust, user-friendly solutions and products.